The writer Olive Cook was best known for her work with her husband, the photographer Edwin Smith. In the year of their marriage, 1954, Thames and Hudson published English Cottages and Farmhouses, with Smith’s soft, large-size black- and-white photographs showing what she described as “the most moving and vivid expressions of the variety which is still the most astonishing quality of the English landscape”. As well as being portraits of houses, many of the photographs unselfconsciously showed people at home, with details of their Victorian furnishings, revealing how Cook and Smith had made friends wherever they travelled in search of subjects. Their books opened the eyes of a generation. Olive Cook was born in Chesterton, Cambridge, in 1912 (although she gave the date 1916 in all reference sources). Her father, who came from a family of ornamental plasterers, worked in the University Library, and her mother’s family, the Webbs, were craftsmen in wood, including rocking horses among their creations. She won scholarships to the Perse School and Newnham, where she read Modern Languages. 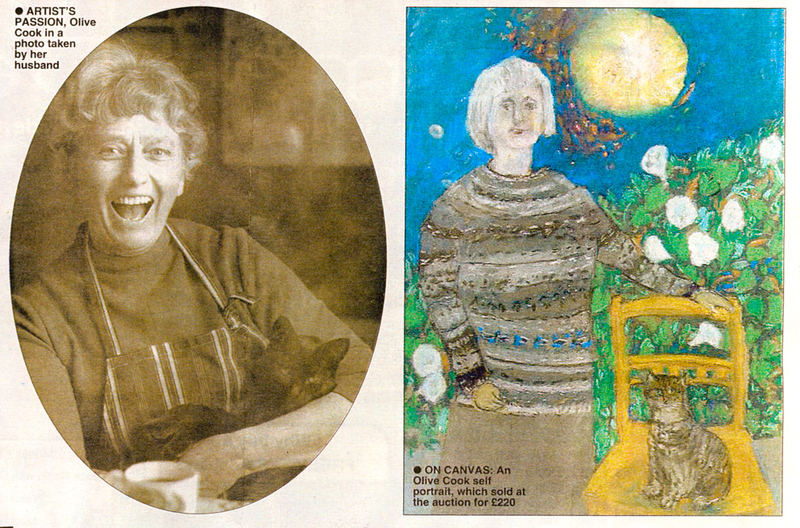 She really wanted to be a painter, and sketched throughout her childhood. Literature and design were combined when she went to work as a typographer at the publishers Chatto and Windus before the Second World War, lodging in Hampstead (drawn there by her love of the work of John Constable). In 1937, she transferred to the National Gallery to become Supervisor of Publications, working closely with Sir Kenneth Clark on the removal of the gallery’s treasures to slate mines at Blaenau Festiniog. During the war, she met many of the Official War Artists, including Paul Nash who after lunch in a restaurant always found that he had left his purse on the piano at home. Several of her watercolours were acquired for the “Recording Britain” scheme (about which she recently spoke on radio). She was among the closest friends of the war artist Thomas Hennell, who died in 1945 in Indonesia. That year, she resigned her post in order to paint and write, producing Suffolk (1948) in the series “Vision of England” and a small book on Cambridgeshire (Cambridgeshire: aspects of a county, 1953). Breckland (1956) is the most readable book about this East Anglian borderland. She began to collaborate with Edwin Smith on articles for The Saturday Book, edited by Leonard Russell, specialising in architecture, travel and Victorian popular art. In 1951 they travelled to Sicily to join in a painting competition at Agrigento open to foreign artists, staying until the following summer, when Cook was awarded the second prize. The visit was recalled in her introduction to Walter Hoyle’s To Sicily with Edward Bawden (1998). Between 1952 and 1964, she was the English Representative for the Carnegie Institute at Pittsburgh and was a visiting tutor in painting and architecture at Denman College from 1956. One of the Smiths’ favourite places was Great Bardfield, where they took part in weekends of fancy dress and charades with John and Lucie Aldridge, Edward and Charlotte Bawden and other artists who lived in the small Essex town. Another focal point was Furlongs, the Sussex shepherd’s cottage where the artist and designer Peggy Angus entertained generations of friends in primitive but stimulating conditions. Olive and Edwin performed magic lantern shows and toy theatre for their friends. After Smith’s untimely death in 1971, Cook managed his collection of negatives and prints and encouraged publishers to keep his work in the public eye. She edited Edwin Smith: photographs 1935-1971 (1984), and wrote a number of her own books, including Movement in Two Dimensions (1963), a study of the precursors of the cinema, some children’s stories and an opera libretto, “The Split Goose Feather”, for Christopher Brown. The Smiths moved from Hampstead to Saffron Walden, Essex, in 1962, living initially in the town centre and later in a converted coach house overlooking fields. Here Edwin’s original training as an architect helped to transform an unwieldy dwelling with additions of Regency charm. The garden was peopled with salvaged statuary and paved with broken crockery mosaics, and the house, flanked by an elegant greenhouse all along its south wall, showed their originality of vision in pictures, wallpapers and objects. They took an active role in the Saffron Walden festivals with the composer Gordon Jacob. They campaigned to save the town’s architecture and to prevent Stansted Airport. Olive worked non-stop without sleep to produce a book, The Stansted Affair, in response to the Government’s overruling of the public inquiry’s rejection of the proposal in 1967. The protest delayed the scheme although it did not kill it. When Edward Bawden moved to the town as a widower, Olive Cook was one of his closest companions and in the 1980s helped to establish the Fry Art Gallery with a collection of Great Bardfield artists. This was one of many places where she organised exhibitions of Edwin Smith’s paintings and photographs, and her own exquisite collages, inspired by Chagall and Kurt Schwitters, were also exhibited there. Olive Cook’s favourite word was “adorable”. She was an enthusiast and an encourager who had a strong rapport with children. Her courage in surviving so many years without “my darling” was admirable. Her hospitality was generous to the point of recklessness and she had a large and devoted circle of friends. Olive Cook, writer and artist: born Cambridge 20 February 1912; married 1954 Edwin Smith (died 1971); died Saffron Walden, Essex 2 May 2002.